But what should you include in a bug out bag, especially if overseas? 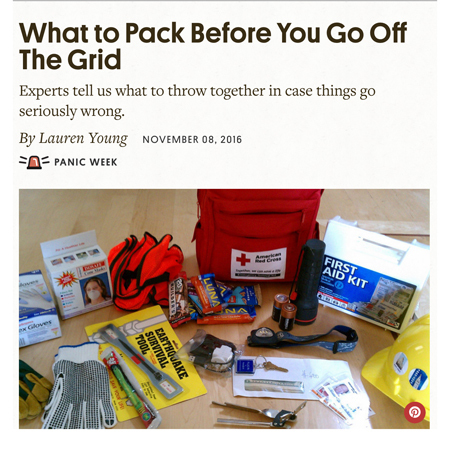 One place to start is http://www.atlasobscura.com/articles/what-to-pack-before-you-go-off-the-grid. There are also a ton of “advice videos” on YouTube (search “bug out bag” or “grab and go medical bag”). Realize that many of these videos may either focus on Zombie Apocalypse or “guns and ammo”-types. Even so, there is good information out there about what you should pack in a bug out bag or grab and go bag. 75 items you might want in your bug out bag are at: https://bugoutbagacademy.com/free-bug-out-bag-list/. 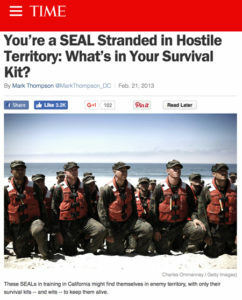 The NAVY SEALS have there own minimalist list at http://nation.time.com/2013/02/21/youre-a-seal-stranded-in-hostile-territory-whats-in-your-survival-kit/. FEMA has a list of suggestions at https://www.fema.gov/media-library-data/1390846764394-dc08e309debe561d866b05ac84daf1ee/checklist_2014.pdf. More at www.ready.gov. If you live overseas as an expatriate or are a team leader with short-term volunteers working for or alongside of you every year, First consider a strong well-kitted out medical bag/first aid supply kit. Your kit should include items for blood loss, emergency blanket, trauma, antiseptic and soap, pain medication, and more. You might also want to consider a good first aid course yourself, or a basic lifesaving course (not just CPR) as well. In case of an emergency, you may not be the only one needing emergency or medical attention. Second, you need to have documents, copies, and a sum of money in both U.S. (if applicable) and local money. You may also want to include any precious jewelry, and irreplaceable items in this category. A record of where you are from, what street you are residing on overseas, your family members, even your pets and photos may help you get reunited in case of emergency. Third, ability to communicate, reach out to family, friends, the USA or home country, the Consulate or Embassy, etc. If you don’t already have numbers written down as well as in your cell phone and computer, add a file to your desktop and send yourself a text and/or email with this information. Do it now. Do not just trust a cell phone alone because the power can run out, it may not be charged, or it may be taken from you, or dropped and broken. Pack an extra battery and/or power bank and cable. The electrical grid may be down in case of a natural disaster so having extra power is critical. Do you have a plan to communicate with loved ones when traveling, running errands, meeting with local officials? At any of these times you may be held against your will or simply disappear. You need to have a way of letting people know where you are going as well as how and when you will check back in. Fourth, any critical medical information: Your travel medical insurance card, or your international medical insurance card and emergency call in number (usually on the back of your card). Take a photo of it but also take a picture of the back. And make sure you print an extra copy for your bug-out bag of each person’s insurance card! Also, copies of any critical prescriptions and blood type/allergies/pre-existing conditions. In case you are unconscious, and cannot speak for yourself, this might just save your life! Many people overseas might not be able to communicate with you well, but may be able to read the English on your documents. Trust us. Things such as an extra pair of glasses and basic medicine you rely on daily should be in your grab-and-go bag as well. Consider, “Where There Is No Doctor” and/or “The Yellow Book” from the CDC – Both printed and on your device(s). Sixth, good clean water filtration and/or iodine and bleach. In case of no water, polluted water, having good filtration (Such as Sawyer) can keep you alive and bug-free in quarantine, in a disaster, in an emergency living situation or in detention. Read more on good small, affordable water filtration at https://www.shorttermteaminsurance.com/news-and-events/clean-water-for-volunteers/. In most disasters, you should think “We’ll need to be able to rough it for a few days to a week” and plan accordingly. Whatever you consider essential for camping, you will also need in an emergency. Lastly, except for well-equipped medical kits, we would discourage purchases of pre-packaged “emergency preparedness kits.” They are often overpriced and not very well-thought out for overseas use. Building one locally, based on your own needs, would be our recommendation. Then, check it/refresh it one a year or every two years. Don’t have international emergency medical insurance? All of our plans include emergency medical evacuation and most have “political evacuation” as well. You are not well prepared if you only have local or national insurance. If you live overseas check out: https://www.gninsurance.com/long-term-international-health-insurance/. If you are traveling overseas for less than a year or so, check out: https://www.gninsurance.com/international-travel-health-insurance-plans/. P.S. – For those just visiting overseas or volunteering, consider both the Travel Safety guide above and a good travel policy. depending on whether you are a team leader or going to an area where medicine is sorely lacking, you may or may not need much more than a good first aid kit and medicine/water filtration for yourself.